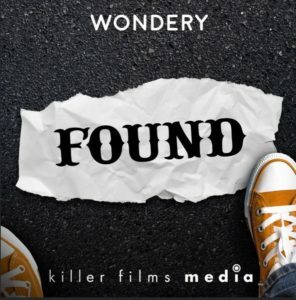 In June 2016, FOUND, a new musical and Killer Films Media in partnership with Wondery announced the launch of the FOUND podcast series and app. The FOUND podcast series explores personal stories of love, loss, hope, transformation and aspiration through the lens of lost and found notes combined with the power of humor and music. The FOUND app features notes from the podcast, giving users a way to track them on a global map, pin finds to a timeline, invite friends to help piece the FOUND mysteries together, share inspirational notes on social media and upload new notes for consideration. The FOUND podcast series and the FOUND app are the next installations in a franchise conceived and created by Emmy Award-winning filmmaker and “This American Life” contributor Davy Rothbart. Rothbart, who hosts the series with co-host Christina Anthony, launched the FOUND brand in 2001 when he stumbled upon a note meant for a cheating boyfriend that had been mistakenly placed on the windshield of his car. This launch marks the 16-year anniversary for FOUND Magazine. Over the last two decades, FOUND has evolved from a magazine publication that inspired a cult following, to threeNew York Times best-selling books, a hit Off Broadway world premiere musical and television and radio segments on “Late Night with David Letterman,” “This American Life” and “20/20”. The acclaimed stage production FOUND, the musical from creators Hunter Bell, Lee Overtree and Eli Bolin, which inspired the podcast and app, recently hit the stage again with the critically-acclaimed Philadelphia Theatre Company’s production, marking the first time a podcast and an app have been produced in concert with a musical. “It used to be that content was king. Well now, content is commodity, and great story is the real royalty. FOUND is so much ‘truth is stranger than fiction’ adventure, we could not resist,” said Adrienne Becker, CEO of Killer Content. For Wondery, a media company specialized in mobile and on-demand audio storytelling, FOUND was its first original series. “Everybody wants to hear a story – and Wondery was created to fulfill that need. We are proud to partner with Davy, FOUND, the musical and Killer in FOUND, our first original podcast and app,” said Hernan Lopez, founder of Wondery. Listeners can subscribe to the FOUND podcast on iTunes and Stitcher. The series is also available on wondery.com/found and Google Play, among others. Full episodes are available every other Wednesday, followed by weekly updates. The format includes a diverse roster of guest hosts and dramatized storytelling. The FOUND app is available for download via the Apple AppStore and and fans can interact with the FOUNDpodcast by way of Facebook, Twitter and Instagram @FOUNDpodcast.